Two Sundays ago for the cocktail hour, I reached for my copy of Gaz Regan's 101 Best New Cocktails 2012 that was sticking out on my bookshelf. Despite having made my way through the book a few times picking out recipes, I still found an unmade gem from Nick Caputo of the Eight Bar in Falmouth, UK. 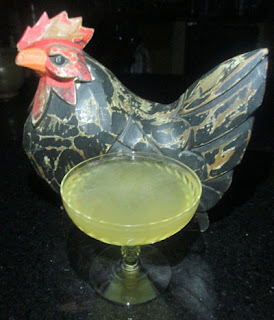 Nick's Foreward was a tequila Last Word variation that opted for crème de peche instead of Maraschino and eschewed the equal parts recipe. Since the metric measurements made it difficult to figure out on my Oxo cup, I reached for my 100 mL graduated cylinder. Technically, I could have hit close using half and one ounce measurements (15 and 30 mL, respectively) and a teaspoon (5 mL) to add or remove a measure (or add two measures), but I had the equipment laying around. The Foreward gave forth an agave and Green Chartreuse aroma at first before the peach began to creep in on the nose. Next, lime and orchard fruit on the sip led into tequila melding into the peach-Chartreuse combination on the swallow. Our crème de peche is a lot more subtle and natural than many peach liqueurs, so the effect will be different by the identity of this ingredient.